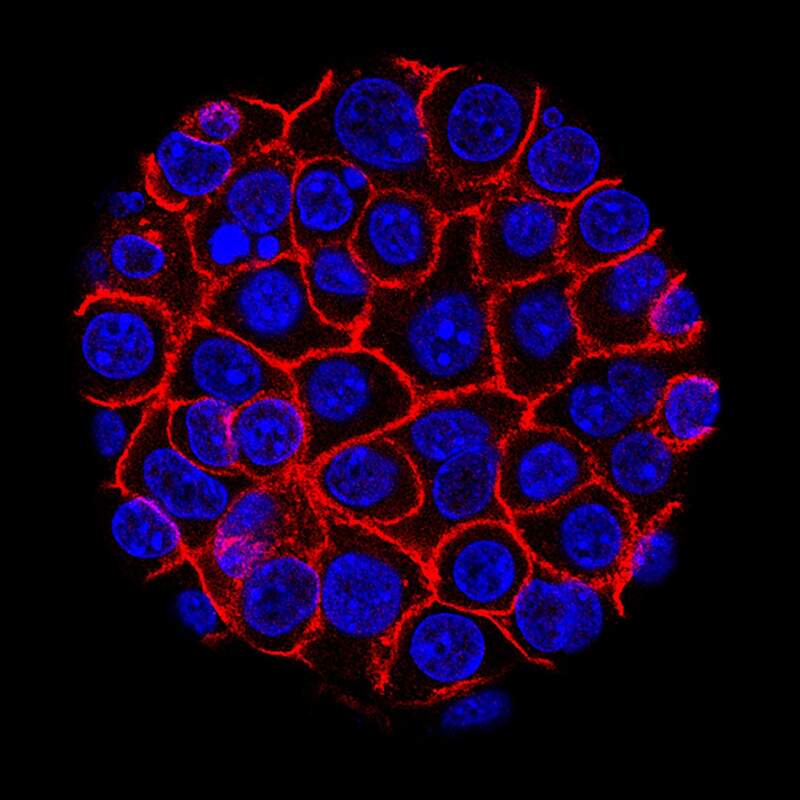 Pancreatic cancer cells, nuclei in blue, grow as a sphere encased in membranes, red. In a rare triumph for tough-to-beat pancreatic cancer, patients who had surgery lived substantially longer on a four-drug combo than on a standard cancer drug, according to research released on Monday. CHICAGO – Patients with pancreatic cancer that hadn’t spread lived substantially longer on a four-drug combo than on a single standard cancer drug, a rare advance for a tough-to-treat disease, researchers reported Monday. Dr. Richard Schilsky, the group’s chief medical officer, called the research an “immediately practice-changing study” and said it’s the biggest advance for pancreatic cancer in 25 years. The outlook has been bleak for patients with pancreatic cancer , an uncommon disease for which there is no screening. Symptoms including fatigue, weight loss and abdomen pain often don’t occur until late, after the disease has spread. The new results are “reassuring for a disease where unfortunately on average people only live several months rather than several years. This is a new standard of care for this illness,” said Dr. Andrew Epstein, an expert at Memorial Sloan Kettering Cancer Center in New York. Folfirinox and Gemzar are available as generics. Schilsky said both treatments are “pretty inexpensive” since the drugs are available as generics. Insurance typically covers both for metastatic cancer and gemcitabine for operable cancer, and it’s likely it would cover folfirinox for operable cancer if guidelines are revised and it becomes standard of care, which several experts say is expected.